Go to INSIGHTS -> LIVE INVENTORY to view inventory. In this page, we get the list of all stocks and finished goods and its expected balance for that outlet. Based on the transactions for the stock we show the expected value. This will get reset once we take a physical stock. This page enables you to take stock taking easily with units of SKU’s prefilled and avoids wrong entries. Items can be sorted in ascending/descending order based on quantity, unit price and cost price. Assumption 1: Entry of stocktaking might be wrong for example, you had an item more in stock but entered less during stock taking, due to sales or transfers the software has depleted the SKU based on expected consumption. Assumption 2: Excess consumption of item than current stock. 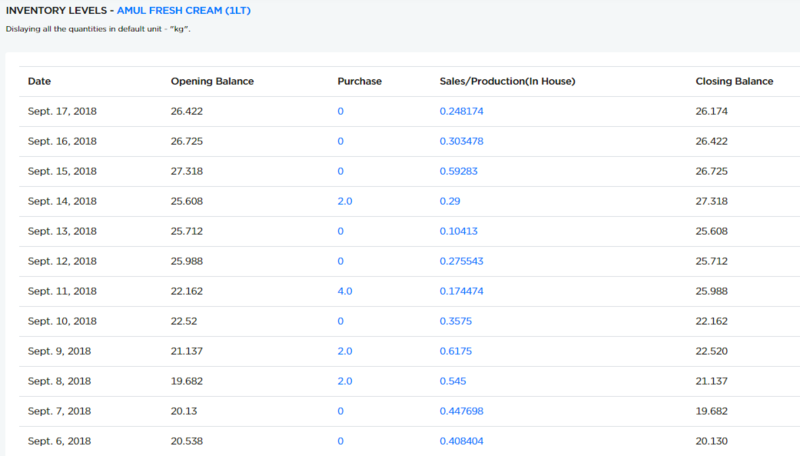 For example, 10 pcs of "Amul Butter is" in stock but 11 pcs (or more) might have been used in recipes or more pcs have been transferred between outlets. Assumption 4: Mismatch of units i.e. an item purchased unit and the unit used in recipes/transfer might be different. Click here for detail. Missing Purchase Entries: If you made purchases but didn&apos;t punch it in to system, this will lead to -ve quantities. Note 2: And also the last stock taking date will be blank for not making a stocktaking entry for the item. These kind of SKUs are highlighted in red border as shown in above screenshot. The SKUs and recipes with zero and negative quantities will be highlighted in red border as shown in above screenshots. Breakdown expenses for all food items are analyzed in this page. Breakdown analysis for each SKU and recipes can be viewed by clicking under the name of the items. Click Inventory Level History to view in detail. The red color is referred for sales and transfer of items and green indicates purchase. In case of production, it is considered as red for SKUs and green for recipes. By default, "last 30 days" inventory level data is displayed. You can click on the numbers highlighted in blue to check the purchase and sales made on that day. As shown in above example, the moment you click on the number, it redirects to PROCUREMENT -> ITEMS page and displays the purchase made on that day. As shown in above example, the moment you click on the number, it redirects to SALES -> BILLS page and displays the sales happened on that day. NOTE: The production is displayed for recipes.